Admission to our Sixth Form is outlined in our Admissions Policy which is updated each year. Students will select three subjects that they will study over a two-year linear course with all formal examinations taken at the end of Year 13. We have generic minimum entry requirements that all students must meet, and additional requirements for each individual subject they wish to study. Show excellent attendance, motivation and attitude. Specific Requirements are listed in the Sixth Form Prospectus. 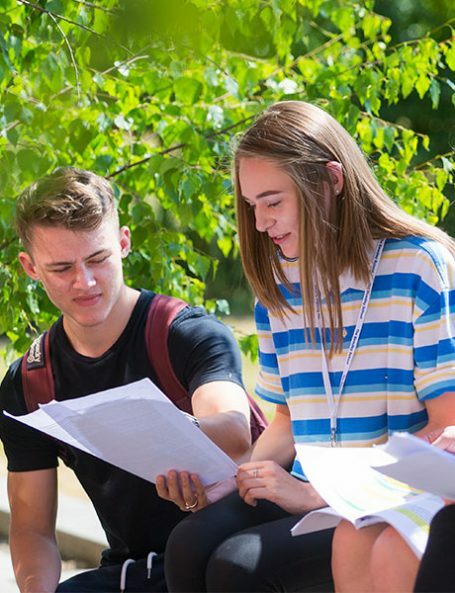 Students achieving a level four in English and Maths will be entered for the qualification as part of their Sixth Form curriculum. For students who are unable to meet these entry requirements at the end of Year 11 but feel that Advanced Level study will be in their long term best interests, we offer a one year Level 2 ‘Bridging Course’. This is a new innovation for the school and whilst it does not guarantee entry to Advanced Level study, is specifically designed to help students to meet the entry requirements. In order to support students who wish to study at A level but do not quite meet the entry requirements we will offer a level 2 one year bridging course next year. This will consist of 4 or 5 one year GCSE courses, based around resit English and Maths, often an issue for those missing the Level 3 entry requirements, and 3 other GCSE courses. These might be, for example, GCSE Sociology, BTEC Applied Science and Cambridge National Creative iMedia. The course will be bespoke and shaped around those who apply. Gain at least a grade 4 in 2 or more subjects. This is an opportunity to tour the school and see different subject areas. You will be able to speak to members of staff and some of our current Sixth Form students. There are separate application deadlines for existing Bewdley School students and for external candidates. There are two main rounds of Sixth Form Interviews. Internal candidates will be interviewed during January 2019, whilst external candidates will be interviewed during February 2019. It is our normal practice for offers to be made shortly after the interviews. Applications to the bridging course are likely to be late applications and will be accepted up to the end of the second week of autumn term. This will be flexible but practical and in the best interest of all students.